A Flash of Stupidity in a Lifetime of Ineptitude! I am so relieved that the Private sector is doing so well. I must have missed it. Maybe because I was worring about my declining income vs. soaring expenses. Silly me! It seems, at least according to the Anointed One, that it is the public sector that is doing so poorly. Obama tells us that States simply do not have the “flexibility” (translation: “the ability to print and/or borrow endless sums of money”) that the Obama regime has. So, I guess then Obama is suggesting that all we have to do is let States print their own money and/or borrow money from the Chinese (just like Obama’s administration does) and the public sector woes will soon be over! At least, that is, until each state is $15 trillion in debt and therefore files for bankruptcy … or request a federal bailout! This is the positively brilliant fiscal policy espoused by our peerless leader, Emperor Obama! I guess he figured this out between the 16th and 17th holes during his last round of golf. In a recent speech, we hear Obama still trying to blame George W. Bush for the astronomical deficit in this country. Of course, this is after three and a half years of his polices; two years of which he controlled both Houses of Congress. He passed his bailouts, his “shovel ready” porkulous bill, ObamaCare, and gave billions to now bankrupt “green energy” companies run by his cronies (oops, I mean election campaign contribution bundlers), but it is still Bush’s fault. It defies reason no matter how you look at it!! Of course, facts don’t matter to his left-wing media machine who dutifully spew forth his rhetoric … including Obama’s brilliant and really cool analogy involving a restaurant tab. President Obama went on the offense against Republicans and their nominee Mitt Romney, pushing back on the often-repeated accusation that his administration has ballooned the country’s deficit. Can Obama can’t really be serious? Even more sadly, the cool aid drinkers actually do lap it up and believe! They cling like rats to a sinking ship, blindly following, soaking up the rhetoric while ignoring all evidence to the contrary that surrounds them. Obama’s true brilliance lies in his ability to play up the “intellectually cheap, populist, class-warfare rhetoric.” He’s not just blaming the Bush-era tax cuts (which he himself extended), he’s throwing in a steak-and-a-martini analogy to really show his pizzaz and bring the message home to his loyal Obama-zombies! Oh well! 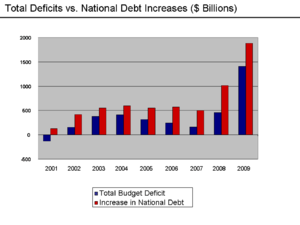 When will Obama and his cronies understand that, simply because former President George W. Bush, who was not a fiscally conservative Republican, spent too much money while in office, Obama’s regime quadrupling down on it, and then some … is not a good thing! Blaming Bush no longer plays … but it seems to be the only card in Obama’s deck. At least Obama is really good at sticking to his message.